The glaciers near our landing site at Neko Harbor in a glorious fjord of Andvord Bay are "calfing" like cows in springtime. Huge chunks of the blue striped ice roars like thunder as it peels off the mother glacier and falls into the bay. It’s a beautiful day, 30 degrees, no wind, and actually a good portion of sunshine bringing the range of mountains surrounding us alive like a whipped cream tarantella. All I can say is it’s beyond beautiful. Photo: "Hey, buddy, have a wing?" Penguins at Neko Harbor. We certainly left our big prints on the small mountains of Neko harbor. 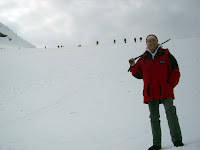 The hard task for many of us was to turn our backs on the two seals sleeping within our reach and the hundreds of penguins sliding down slopes to the sea in order for the physically challenged to climb the steep ice/snow mountain in our Muck boots and with our third-leg sticks. I fussed at myself the entire way saying I was going to stop here, huff, huff, no I’ll go further, huff, huff, and finally there I was at the top doing the "Rocky" dance. Actually I reached the summit quite fast and was one of the first coming back down - except for a couple of guys (my cabin neighbors) who slid down on their bums. Oh! It felt GOOD to get to the top because underneath the layers of clothing and long underwear, I was enjoying a good cleansing sweat for the first time since I left the Memphis tennis court and gym. Photo: "I'm gonna climb that mountain at my back in the snow!" Yesterday morning we were allowed to kayak again at Petermann Island where Adelie and Gentoo penguins nest on the rocks and porpoise (a verb here, meaning jumping out of the water like a porpoise) through the cold clear waters. My kayak partner this time was a travel writer filming the fun with one hand and trying to paddle with the other. I sat in the back and was in control of the turns and basic paddling. We had lots of laughs when we weren’t snapping the incredible scenery. Then we discovered our ship’s bartender was on a Zodiac with two helpers and a bar - either hot chocolate or good whiskey. Of course you had to be able to paddle up to the Zodiac correctly if you wanted to toss one down. We stayed out on the water about two hours. It’s hard to get me to come in. In the afternoon, we were scheduled to visit the Argentine Islands station where Ukrainian scientists collect meteoric and ionospheric data used in ozone research (we are under a major ozone hole here in Antarctica.) But best, for drinkers on board, was the promise of homemade vodka! (Made in Antarctica?) However, the ice was still too thick for the Endeavor to break through. 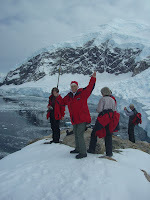 So the captain turned the prow south to see how far we could get through the ice toward the Antarctic Circle. It was a frightening adventure for those of us who had memories of the wrecked Explorer and visions that all the ice floes and icebergs we were slowly pushing through and were quickly closing behind us might keep us here forever, frozen in Antarctica. Trust me, our captain is "cool" and he knew this ice was softer sea ice. He wanted to make up for the disappointment in not visiting the Ukrainian station by hunting for seals on ice. And we saw seals. Many seals - mostly alone floating on huge ice pieces. Photo: This is called Belly Down. Seals are the southernmost mammal after man. They will saw through ice with their teeth (which gives them toothaches) to make a hole so they can fish for their food. Their lives last only as long as their teeth. There are about 50 million seals in the Antarctica even though Orca whales eat them for dinner when they can brush them off an iceberg. We have seen three kinds of seals in Antarctica - the Weddell seals with tiny heads and cat like faces with big baleful eyes who spend most of their time in the water or on ice. They are big, fat, often alone, live 18 years, live mostly on land, eat fish, squid and other seals, but not krill. Crabeater seals are missed named. 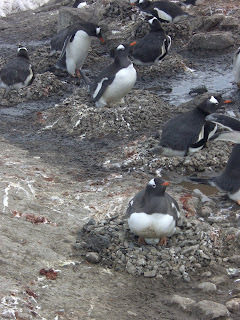 They have nothing to do with crabs because there aren’t any shellfish in Antarctica. But a "namer" saw red stuff dripping out of the Crabeater’s mouth - which was krill - and was miss-read as crab juice. These seals with dog-like faces eat mostly krill and live 29 years. Their conical teeth have evolved into cuspids that hold in the krill. 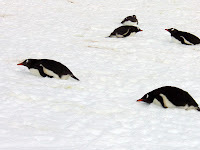 They are mostly found on the floating ice. The Leopard seal, has a spotted coat and a snake-like head, eats mostly krill, penguins and seal pups, a little fish and squid and lives to be 26 years old. In this species the female is about 300 pounds heavier than the male. They have a dinosaur looking head with wide nose holes and can eat a Gentoo penguin in a second with its wide mouth. Seals don’t move much. They sleep, loll, raise a flipper, open those big sad eyes, maybe yawn to expose a red mouth and amazing teeth, then sleep more. Must be tough being so fat, and yet the fat is a life vest to ward off the cold icy waters in which they are so buoyant. One which our ship got very near allowing us to observe for a long time was a leopard seal mom with a nursing pup. That was a first. Photo: Both moms and dads sit on the egg in the nest. Look closely, and you'll see the egg under the penguin in the foreground. Meanwhile the captain nosed the ship as far south as 65 latitude 34 degrees, which is the farthest south any expedition ship has reached this spring. 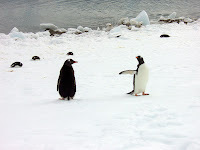 (Fifty nautical miles from the Antarctic Circle.) We had to turn around for the ice and sailed back through the tight Lemaire Channel into the calm seas of the Penola Straight once more. During dinner, we passed a large ice berg where a whole family of taupe-colored crabeater seals had set up home. Amazing.